Stella McCartney silk satin tank with lace trim. Fly open back with ribbon ties. Eberjey "Georgina Sophisticate" camisole with lace-trim. V neckline; square back. Thin, adjustable shoulder straps. Empire waist; eased sweep. Straight hem. Eberjey "Georgina Sophisticate" camisole with lace-trim. V neckline; square back. Thin, adjustable shoulder straps. Empire waist; eased sweep. Straight hem. Modal/spandex; nylon/spandex lace. Imported. Model's measurements: Height 5'10"/177cm, bust 33"/84cm, waist 25.6"/65.2cm, hips 35.8"/91cm, dress size US 2-4/FR 34-36. Black jersey with ivory scalloped lace trim. V neckline; adjustable straps. Bow at center front. Pullover style. Modal/spandex. Imported. Model's measurements: Height 5'10"/177cm, bust 33"/84cm, waist 25.6"/65.2cm, hips 35.8"/91cm, dress size US 2-4/FR 34-36. Halston Heritage camisole top with draped trim. Square neckline and back. Thin, adjustable shoulder straps. Popover with beaded trim. Relaxed silhouette. Straight hem. Rayon/polyester. Dry clean. Imported. Model's measurements: Height 5'10"/177cm, bust 33"/84cm, waist 25.6"/65.2cm, hips 35.8"/91cm, dress size US 2-4/FR 34-36. 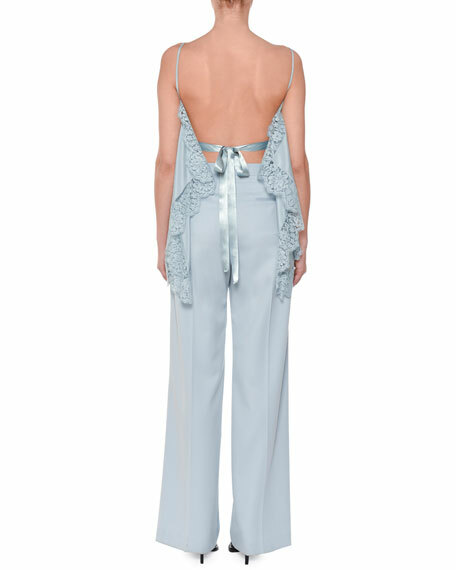 Josie Natori "Charlize" lounge/PJ camisole. Scoop neckline; lace trim. Adjustable shoulder straps. Semi-fitted silhouette. Scalloped hem. Pullover style. Micromodal rayon. Josie Natori "Charlize" lounge/PJ camisole. Scoop neckline; lace trim. Adjustable shoulder straps. Semi-fitted silhouette. Scalloped hem. Pullover style. Micromodal rayon. Imported. Shorts, shown, are not included. Model's measurements: Height 5'10"/177cm, bust 33"/84cm, waist 25.6"/65.2cm, hips 35.8"/91cm, dress size US 2-4/FR 34-36.